Christian M i s c e l l a n y. An assortment of other Christian links in the net. In theory, anything good under the stars, regardless of color, can come in here, as long as it is relevant to the Catholic Christian Church and cannot be readily included within the other pages in this website. Be good Christians, or your journey will serve you no good purpose. Only by good example can you change the world. What is the meaning of AMDG? Veritas' Daily Bible Reflections is among the top 100 (in popularity) religious sites in the net (according to Web Statistics). When a person comes to terms with his feelings, when he lives in God and walks by the light of faith, he has attained that stillness of the night which God is waiting for..."It is then that the Word of God comes to birth in him in a way which is entirely of the spirit, entirely of God." --Saint Paul of the Cross. A calendar listing the various feast days and Holy Days of Obligation according to the Roman Catholic Church. Maintained by Robert & Linda Easterbrooks. Comprehensive Directory of Catholic Dioceses, parishes, organizations, and periodicals on the World Wide Web. Also includes Catholic newsgroups, Mailing Lists, Online services and E-mail directory. An Internet Service of the Mary Foundation. Home to Dozens of Catholic OrganizationsCatholiCity offers the ultimate cyberspace clearinghouse for Catholic information, interaction, prayer, and entertainment. Include The Franciscan Experience homepage, The Franciscan Custody of the Holy Land homepage, The Maltese Franciscan Province homepage, and more special links....A joint project by the Franciscans in Malta and the Holy Land. Turn your living room or office into a "virtual monastery" -- Net Radio now provides 24 hour, 7 day a week living streaming RealAudio in stereo of some of the most beautiful and devotional music, Gregorian Chant, to accompany your visit to this site, or while you work. You'll need at least the Real Audio Player 3.0 to hear EWTN or the choral music that we've got to accompany your devotions, but the latest Real Audio Player 5.0 just released is available free by clicking the graphic. Turn off the music for this page (see controls at the bottom of the page) before clicking on the Gregorian Chant Link. Catholic Heavenly Network for Jesus Christ serves the International Catholic Community via the Internet and in locations throughout the United States. 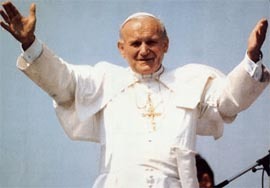 Man of the Year, John Paul II. "I did try to found a heresy of my own; and when I had put the last touches to it, I discovered that it was orthodoxy"
1996 Nobel Peace Prize Winners. Please pray for the East Timorese. Padre Pio was a modern day Saint (though yet to be officially canonised by the Church) who bore the stigmata, was a prodigious miracle worker and was divinely granted gifts of prophecy, bilocation, discernement among others; his favorite saints include St. Francis of Assisi and Pope St. Pius X. If you find difficulty in accessing the Padre Pio Homepage, try the Padre Pio Foundation of America. A place of faith, hope and charity...This page was created as an act of faith and love to our Lord Jesus Christ and to His Blessed Mother Mary, in the hope that my efforts may bring others to discover the deep, and burning love that they have for all their children. The internet has plenty of offensive and sinful material. Relying totally on the Government and the Internet Service Provider or our instant wisdom or judgement to screen out the undesirable sites are usually not sufficient. Read Me or Rue it. RCNet hosts home pages free of charge to Catholic parishes and schools. Siostry i Bracia Grupy Zielonej WAPM. 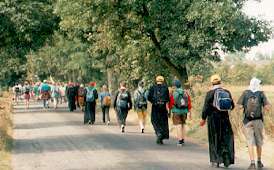 ...Most welcome and join to our pilgrimage community in August 2000! What? Catholic pedestrian pilgrimage. Who? 5 thousand young people. When? 2nd - 11th August 2000 Where? 300 km in Poland, between Warsaw and Czestochowa, Black Madonna Shrine. Why? Love of God and Blessed Mother Mary; prayer, community, expiation. The route of the pilgrimage is more or less 300 km (daily walk of 30-35 km), regardless of the rain or the sun. Piglrimage bypasess big cities; our way leads through some villages, forests, open fields. Night's lodging is your own tent. Our bags and tents during the day are transported by the tracks. No smoking, no alcohol, no co-education, no drugs, no bath in the rivers, proper dress. Categorically do not use the candle-lights in your tents. Biography of the Founder of the Society of Jesus. There are a number of good sites on Saints in the web: some are listed in this page. Eventually, a separate Saints Page will be set up in this web site. In the mean time, please see the ones in here or read about Patron Saints. Since saints led holy lives and are close to God in heaven, we feel that their prayers are particularly effective. Often we ask particular saints to pray for us if we feel they have a particular interest in our problem. St. Joseph and the Child Jesus. Ten commandments for peace on roads. Often tense, impatient, aggravated or angry on the road? How should we drive like a christian? Welcome to Veritatis home page. We are located in Tasmania, the southern most state of Australia. This page provides links to other sites of interest, especially sites which deal with the Catholic religion, faith and life issues. Welcome to the Roman Catholic Church.